Adult 8" Youth 7" Custom Size. Tell us what you need. Enter One slogan and Special instructions. Extra colors can be listed here for your quantity. Please let us know what we need to do to earn your business. Minimum order of 250. We tried a hundred minimum, but lost money on those orders. After you submit your order, we will email a digital proof to you the next business day. Once approved by you, and depending on the quantity, we will produce and ship your order within two weeks or less. Free shipping to any destination. ***Discounts are applied for quantity purchases. Our custom silicone wristbands offer a very classy way of promoting your brand, or even providing a great souvenir for a certain event or gathering. We have been providing high quality silicone wristbands for 16 years because people love our quality and delivery time. You can easily customize your image in whatever color you want it to have. 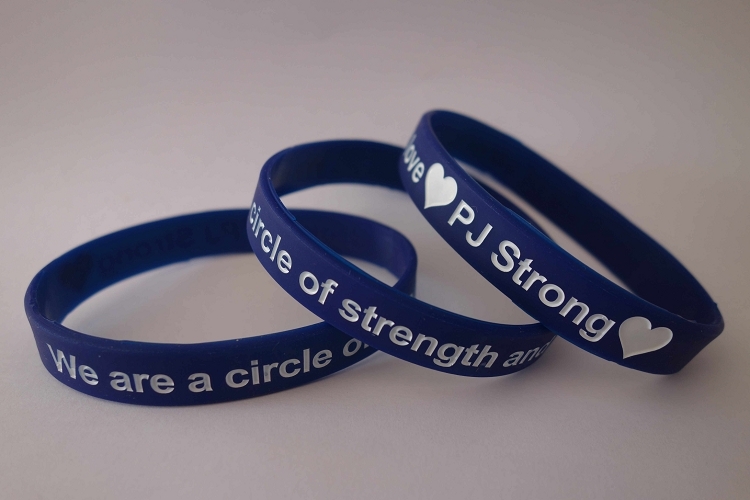 Your logo can be printed or debossed (engraved) into the wristbands along with your slogan. They are available in Adult (8") Youth (7") or even custom sizes that provide a comfy fit. The silicone wristbands serve as a great way to raise funds for charities and organizations or to recognize memories of a loved one. Due to copyright laws, we are not allowed to post the PMS color chart on our website. If you enter your colors at check out, your proof can be adjusted until we are sure you are happy with everything concerned with your order. Other features are available, such as color fill in your debossed message. Glow in the dark, different color sections, colors that are swirled together are available. We just need to talk about your needs and wants. Please feel free to call 253 841 4057 to discuss your order. If you need assistance, we would love to work with you so that you get exactly what you want. Please allow approximately 2 weeks to delivery from approval of the proof we email to you for approval. Faster delivery is likely for small orders of 500 or less. BEFORE YOU BUY, COMPARE US ON THE BBB. 16 Years without an unresolved complaint, the last 13 years with no complaints, allows us to stand out as a highly trusted company offering high quality wristbands.